Can Two Wives, Four Children & One Husband Co-exist In One City? In this charming romantic comedy, Maria (Il Postino's Maria Grazia Cucinotta) daringly travels across the Atlantic Ocean in pursuit of the wayward husband who left her and their children in Italy to pursue his career as an artist in New York City. Soon after arriving in New York, Maria learns that her husband married another woman, the very pregnant Charlotte (Brooke Shields). Through a series of comical mishaps, Maria and Charlotte forge an unlikely friendship as they struggle to sort through the upheaval their shared husband has unexpectedly caused. Although Maria came to New York to reclaim her husband, she instead re-discovers herself and in the process creates her own definition of marriage, friendship and family. 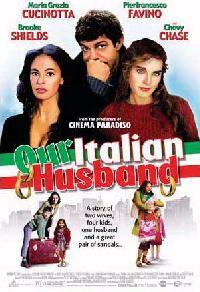 Echelon Entertainment 2 proudly announces the theatrical release of the romantic comedy Our Italian Husband. Co-produced by Cristaldi Pictures, the company that created "Cinema Paradiso" and Senza Pictures, Our Italian Husband takes its inspiration from the farcical Italian comedies of the 1960s. Our Italian Husband opened April 21st in limited theatres in New York, Chicago and Boston. Please check local lostings for theatre locations and showtimes.